Tickets for the second annual Boca Raton Bowl will go on sale to the general public on Thursday, October 1. The game will be held at FAU Stadium on Tuesday, Dec. 22 at 7 p.m. Ticket prices for regular reserved seating will begin at $27 for end zone locations and $47 for sideline seats. Group rates will be available for both small and large groups. Tickets can be purchased by calling the ticket office at 561-362-3650, visiting http://espnevents.com/boca-raton-bowl/tickets/ or e-mailing tickets@thebocabowl.com. The inaugural Boca Raton Bowl, announced by ESPN in October 2013, was held on Dec. 23, 2014. It was the only bowl game other than the College Football Playoff Semifinals and Championship to feature a matchup of two conference champions, when Conference USA (C-USA) champion Marshall defeated Mid-American (MAC) champion Northern Illinois 52-23. In an agreement with the American Athletic Conference (AAC), C-USA and MAC, a team from each conference will make four appearances over the initial six years, with the MAC and the AAC squaring off this year. 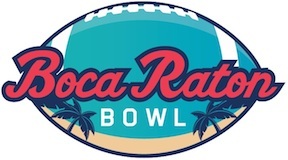 For more information about the 2015 Boca Raton Bowl, please visit www.THEBocaRatonBowl.com or follow us on Facebook and Twitter for all the latest bowl news. ESPN Events, a division of ESPN, owns and operates a large portfolio of collegiate sporting events worldwide. The roster includes three Labor Day weekend college football games; 13 college bowl games, 10 college basketball events and two college award shows, which accounts for approximately 250-plus hours of programming, reaches almost 64 million viewers and attracts over 700,000 attendees each year. With satellite offices in Boca Raton, Boise, Birmingham, Dallas-Fort Worth, Albuquerque, St. Petersburg and Las Vegas,ESPN Events builds relationships with conferences, schools and local communities, as well as providing unique experiences for teams and fans. Boca Raton Bowl/Orange Bowl Media Contact: Rachel Rodriguez at media@thebocabowl.comor 305-341-4785.